Most relationships end in breakups as we go through trial and error to figure out what is best for us. Don't despair that relationships fail - learn to find what the lessons are and move on to find the man truly deserving of your love. Most relationships are NOT meant to last. You go through many dates before you find the one that is right for you. 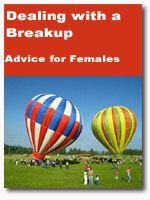 This ebook will help you get over that breakup and get out to find that guy who is truly right for you.